Byron has two particular strengths, the first being consistently great, cooked-medium beef burgers. Having 'Proper Hamburgers' as their slogan might seem dangerously like stating the obvious but these things can be surprisingly difficult to find in London. Luckily Byron appear to be taking over the market, with three openings in as many months. 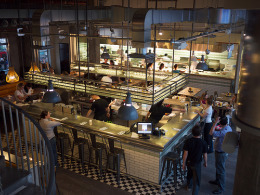 Canary Wharf is home to their newest restaurant which officially welcomes customers today. They're on the top level of Cabot Place East, alongside their company stablemates Pizza Express, in an airy double height unit with a booth-lined mezzanine upstairs. The decor is comfy leather seats with industrial fittings. Having enjoyed a great evening at their recent opening at Wellington St, we popped along to Docklands to the try the fare, and the patience of the waiter by ordering double skinny burgers with cheese (that particular combo isn't on the menu). That's where the other advantage they have comes into play: friendly, efficient staff and professional service. Everything arrived exactly as ordered, along with an impressive looking Cobb salad. Other sides include courgette fries and macaroni cheese, as well as the usual fries. Each restaurant has its own quirks, such as the Private Eye-papered bathrooms downstairs. Our personal recommendation is the Byron, a mature cheddar cheeseburger with dry cure bacon and their special sauce, £8.50, with an exhortation to leave room for a brownie if you can. One of our dining companions on our last visit pointed out that if you're vegetarian and don't fancy mushrooms, the options are limited. But let's be honest, you really don't go to Byron for anything but a burger. If it's a burger you want, then it's probably the best in town.